Thanks to a generous gift from the Washington and Lee Class of 1966 on the occasion of their 50th Class Reunion, Washington and Lee will at last have a definitive chronicling of its history! Through many years of planning and hard-work, W&L commissioned noted historian Blaine Brownell ’65 to research and pen Washington and Lee University, 1930-2000. Washington & Lee is consistently ranked as one of the top private liberal arts colleges in the United States. It is also well known for its school of law. The university is the alma mater of three United States Supreme Court Justices, over twenty United States Senators, over sixty United States Representatives, over thirty governors as well as a Nobel Prize laureate, winners of the Pulitzer Prize, the Tony Award, and the Emmy Award. 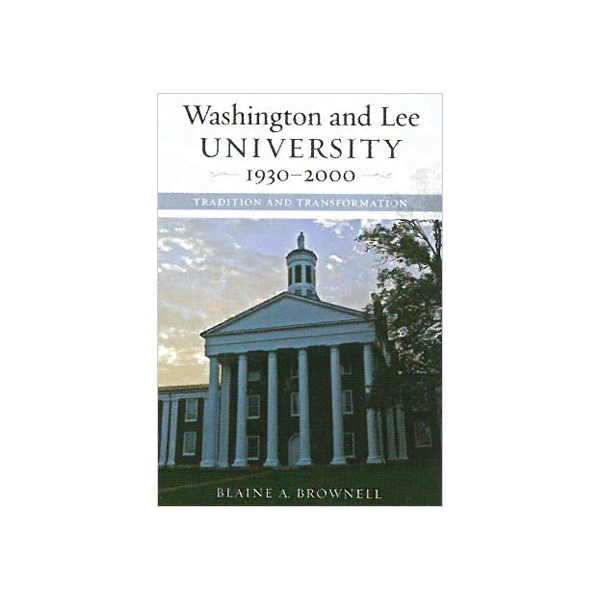 Brownell’s history of Washington & Lee picks up the school’s story in 1930, where Oliver Crenshaw’s General Lee’s College, the university’s first published history, ends. In the period from 1930 to 2000, Washington & Lee experienced numerous critical changes, including the integration of its student body and a transition from being an all-male institution to a coeducational one. This objective and detailed history offers an expertly written account of Washington & Lee that will appeal to alumni and historians of higher education alike.